Wrinkle ridges and depressed troughs combine in this depressed crater in the Goethe basin on Mercury. The troughs, up to 2 kilometers wide, crosscut the outer ridge ring. New photos of the baked planet Mercury, the closest world to our sun, have revealed odd formations that look uncannily like cosmic pies, evidence of potential "ghost" craters hidden underground, scientists say. The new Mercury photos by NASA's Messenger spacecraft show unusual landscape on the planet's volcanic plains that have no equal anywhere in our solar system, researchers said. 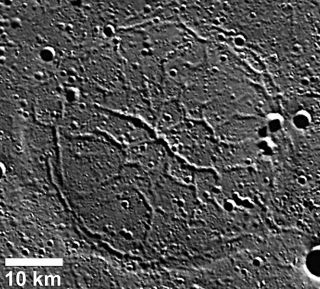 They feature giant ring structures dotted with wrinkles and so-called graben (big troughs), which outline the buried ghost craters. "The pattern of winkle ridges and graben resembles the raised edge and cracks in a pie crust," study leader Tom Watters of the Center for Earth and Planetary Studies at the National Air and Space Museum said in a statement. The images of Mercury's volcanic plains indicate both a pushing together and a pulling apart of the planet's surface. "It's pretty exciting because it's telling us that there's something really very different going on on Mercury that we have not seen on the moon, Mars or Venus," Watters told SPACE.com. When Mariner 10 flew by Mercury in the 1970s, it captured images of the rocky planet that revealed evidence that it had been tightly squeezed. Forty years later, NASA's Messenger (an acronym of MErcury Surface, Space ENvironment, GEochemistry and Ranging) spacecraft obtained new data that provided further insight into the stretching and tightening of the planet's surface. This Messenger photo of Mercury shows wrinkle ridges around a network of troughs that formed when the volcanic plains were stretched apart. The wrinkle-ridge ring, about 100 km in diameter, is formed over the rim of a so-called ghost crater. "Mercury is a planet that we know is contracting, or has contracted in the past," Watters said. Less common are graben, depressed troughs that form when the surface between two parallel faults drops down. Such features indicate a pulling apart, and have been seen inside impact basins. But Watters and his team have found the two features together in regions of volcanic plains, predominantly located in the northern high latitudes. "What's so unusual about these features is that they are not sitting in basins, but are exposed on the surface," Watters said. He also noted that their close proximity to one another makes them distinctive. Around a billion years ago, volcanic material rapidly flooded impact basins on Mercury. The large volume of lava, deposited over a short period of time, could have caused the creation of the unusual troughs. The kilometer-size pools acted as a single unit, with the temperature dropping fairly evenly. As the cooling lava contracted, the material underneath it resisted, causing stretching and breaking along the pairs of faults so that the lava dropped down to form graben. At the same time, the contraction of Mercury pulled at the surface of the plains to create the wrinkle ridges. While the depressed channels likely formed during the last pulse of volcanism on the scorched planet, the wrinkle ridges took longer, while the surface slowly shrunk. "The story of how they're connected is kind of intriguing," he said. The research is detailed online in the journal Geology. Scientists still aren't sure how long volcanism lasted on the rocky planet. The volcanic plains may date almost as far back as the period of heavy bombardment, around 4 billion years ago, when collisions ruled the early solar system. Many of the craters on the moon formed during this time, as the last bits of loose rock crashed into the planets and other bodies. As the collisions declined, lava swept over parts of Mercury, filling in craters and creating smooth features. Graben formed within these impact craters, but they seemed to be the only regions where the surface evidenced any sort of pulling apart. "Mercury was in such a dominant state of contraction that it was just shutting off extension anywhere outside of the impact basin environment," Watters said. But the pools of lava indicate the crust continued to extend in some ideal locations. The combination of rapidly pooling lava with the contracting planet allowed for the creation of the unusual features. Both Mars and the moon host evidence of graben, but not in combination with the wrinkle ridges, formed by Mercury's rapid contraction. "The deposit of those volcanic material on the moon and Mars happened over much longer periods of time, so the individual cooling units never really got that thick," Watters said. Without the sustained surface contraction, the graben found elsewhere in the solar system weren't found paired with wrinkle ridges. "It just means Mercury is such a unique body in so many ways."